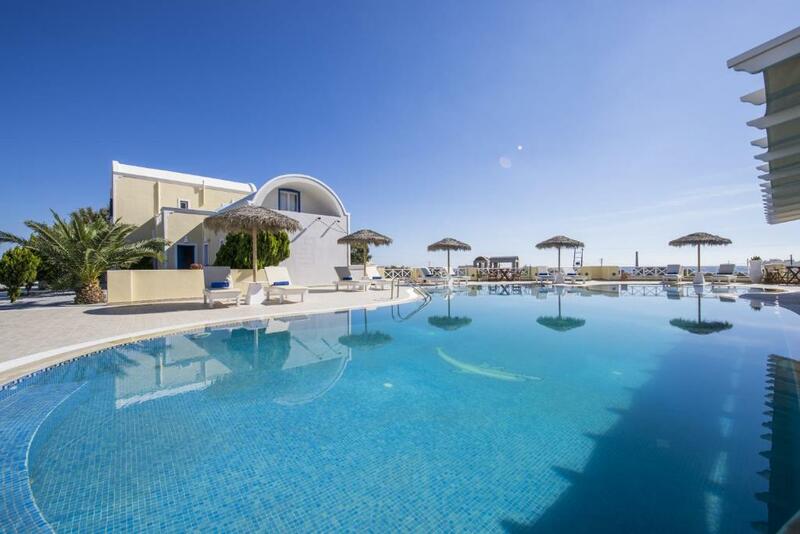 Located 650 feet from Perivolos Beach, Bella Santorini offers self-catered rooms with balcony. Features include a pool with hydromassage corner and sun-lounger terrace and Wi-Fi is free throughout the hotel. Decorated in contemporary Cycladic style, Bella Santorini’s spacious rooms offer a furnished seating area, and a kitchenette with kettle and fridge. All units have a spacious bathroom with bathtub. Each has a plasma satellite TV, and the private balconies offer sea, pool or garden views. Guests can enjoy American buffet breakfast including homemade flavors, by the poolside or in the privacy of their guest room. Special breakfast menus are also available upon request. In the evenings, the illuminated pool area is the perfect spot to enjoy a drink from the bar. Staff at the front desk can arrange car/motorbike hire and information on flights and ferry schedules. Weddings in a private church can also be arranged. Restaurants, bars and a mini market are a 2-minute walk away. Free private parking is available. When would you like to stay at Bella Santorini? Offering garden view from its balcony and free WiFi, this air-conditioned apartment includes a spacious seating area. Towels are changed daily. This apartment consists of a separate bedroom, a seating room and a balcony with views of Perivolos Beach. A well-equipped kitchenette and free Wi-Fi are featured. This apartment opens to a 45-m2 balcony with Aegean Sea, pool and garden views. It consists of 2 separate bedrooms, a kitchenette and living room. Free Wi-Fi and a flat-screen TV are included. Located on the second floor, suites offer a sea-view bedroom, and a combined living/kitchen area. Their spacious balconies offer view to the swimming pool, the garden, and the Aegean Sea. Suites guests are welcomed with a fruit basket and a bottle of the finest Santorini wine. Features a private sea-and-pool-view balcony of 50 square yards. Located on the first floor, this split-level villa has a bedroom, bathroom, spacious living room and kitchen. It also features a private, outdoor hot tub. Two extra guests may be accommodated (see Hotel Policies for extra charges). Offering a garden or sea view from its balcony and free Wi-Fi, this air-conditioned studio includes a seating area. Towels are changed daily. A laptop can be provided at extra charge. This apartment has a balcony, sea view and satellite TV. House Rules Bella Santorini takes special requests – add in the next step! Bella Santorini accepts these cards and reserves the right to temporarily hold an amount prior to arrival. Please note that the reception is open from 08:00 until 23:00. Kindly inform the property in advance of the age of children who will be accommodated. Please note that extra beds and baby cots are subject to availability and need to be confirmed with the property. Please inform Bella Santorini of your expected arrival time in advance. You can use the Special Requests box when booking, or contact the property directly using the contact details in your confirmation. We need at least 5 reviews before we can calculate a review score. If you book and review your stay, you can help Bella Santorini meet this goal. WiFi wasn’t working for most of our stay due to electrical issues. TVs also didn’t work as they had been taken down due to renovations and not fully reinstalled. Both are ultimately minor issues probably resolved by now. The newly renovated rooms were gorgeous. The pool was lovely and the staff helpful. The hotel is at one end of the beach and most touristy places at the other end so it was peaceful. If you stay here, you must eat at the Nets (nearby on beach front) or get a made to order pizza at the pool! Just the location.. there were only two restaurants nearby. The place was absolutely perfect, swimming pool, nice view, good breakfast and finally host, Lina and her family were just amazing and super nice!